ColoredGroups - Simple, yet powerful! Format chat with incredible ease! Supports all permissions systems that Vault supports. Ability to color players nametags based on their colored group! Attention: ColoredGroups disregards prefixes from your permissions system, it allows you to easily set chat colors in the ColoredGroups config.yml rather than with your permissions system. ColoredGroups works by "hooking" into your permissions plugin to see how to format chat messages. 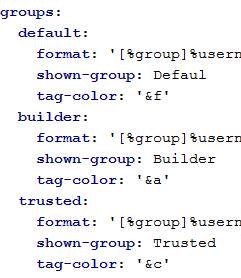 You need to properly configure ColoredGroups in order to work, however it is very simple. Once you map all your ranks over to ColoredGroups, you can now configure the colors how you please. Can you please update this plugin to 1.6.4? Hello, I have dropped the .jar into the plugins directory, however no folder is made for config, and I am not able to go /cg help or any command related with ColouredGroups. I have reload, restarted and reinstalled but no luck! Are you going to add colored tab support for groups? That'd be awesome so I can lower two plugins with just this one. I use towny and the town prefix dissapears when i add this plugin, But when i add %t it came back but the color of the muffix sets to white any solution? 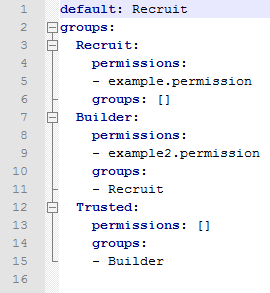 Hmm, I use bPermissions and I'm sure I hooked up all my ranks the right way, but It still doesn't seem to work, is there any reason for that to happen? This plugin is used to format chat, it's not a permissions plugin. How do you rank up someone? Oh OK it's through the permissions system. Got it, thanks. I know this is probably a stupid question, but I can't figure out how to add players to groups. Is there a command, or do you have to do it in the config.yml file. I'm new to bukkit, so the answer is probably going to be obvious. You have to follow the proper formatting and syntax of YAML, it's quite simple once you master YAML. How do you add more groups to the config becuase whenever i try to add my donator rank it never works. Someone please tell me why my colored groups file clears all the ranks when I restart my server and how to fix it, PLEASE. It is one of a few things that is holding me back from officially launching my server! Perhaps adding an option to buy specific rank with in-game money would be nice. Thanks, glad you enjoy it. About the 'farther update', what did you have in mind? I generally don't add much as some people are interested in a non-intrusive chat plugin, not a large 'suite' which may be what you want but you're stuck with because it's bundled. Hey dude good work! 5 stars keep up the good work and im waiting for farther update!